Marseille is a multi-faced city impregnated with a unique culture in France. Each year, thousands come and visit the city. But discovering this big city on your own can be difficult, so we decided to propose you a top 10 activities and visits in Marseille. 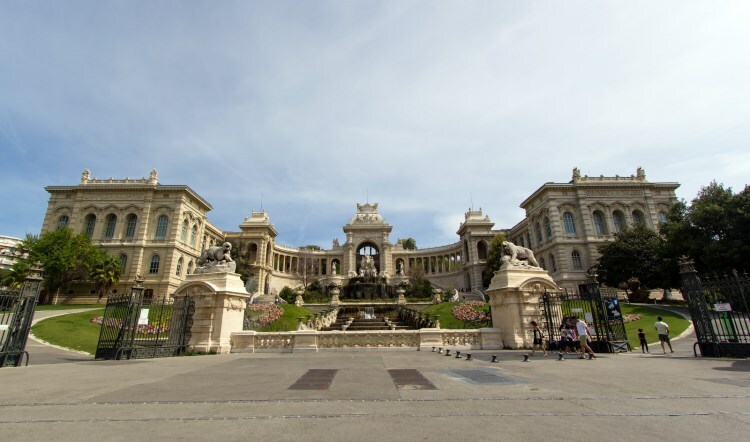 The Palais Longchamp was designed by Henry Espérandieu in 1839 to divert the river Durance toward Marseille. This is still its purpose today, as we can see with the wonderful waterfall in the park. Above the cascade is a chariot pulled by four Camargue bulls. The view of the cascade under the light of the dying sun is stunning. The Palais Longchamp comprises other secrets like the Fine Arts museum and the Natural History museum. The first includes paintings, sculptures and drawings, some from the 16th century. The museum has been renovated not long ago, and it is a true marvel for all art amateurs. On the other hand, the Natural History museum is a journey through time and space, with many specimens of animals, plants and fossiles from all continents, but also skulls and bones in the osteology room. You can end you visit in the zoological garden, very nice and quiet. Our advice: Do not bother with the guided tour, which are rather long. This historic landmark almost looks like a small village, and yet it is an important piece of Marseille’s history, as the tower of King René and the Tour du Fanal, at the two extremities of the keep, prove. This building served as a command post, a jail and even a warehouse during the German occupation in World War II. It is definitely a place you must visit when in Marseille. During you visit, you can see the beautiful chapel of the keep, with its imposing bell tower, recently renewed. you will see the harbor’s fountain, and you will take the different galleries, such as the cannon’s or the officer’s gallery. If you climb up the stairs of the towers, you will have a beautiful view over the Mediterranean sea and Marseille. Our advice: Enjoy the astonishing view from the towers. When you see the Palais du Pharo for the first time, you are struck by the building’s appearance. Far from looking like a palace, and more like a beach resort, it can be confusing. It does not exactly looke like an imperial mansion. 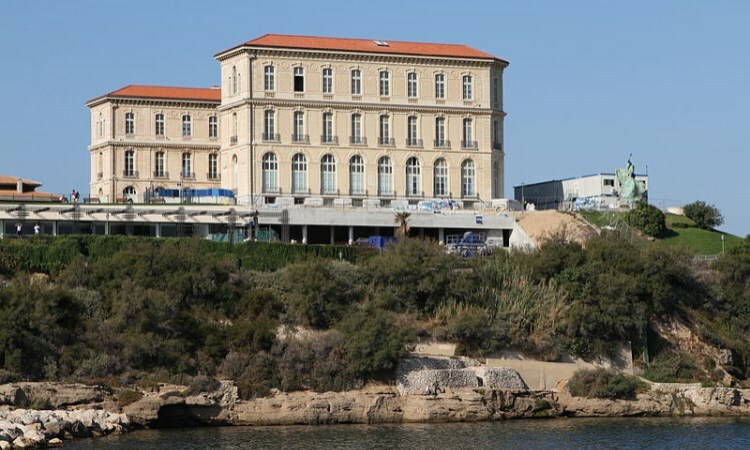 And yet, the Palais du Pharo is one of those buildings that take you from the story to the history: this magnificent palace was built under the order of Louis-Napoléon Bonaparte, Emperor of France, who, on a visit to Marseille, decided to have “a mansion with the feet in the sea”. During the tour, you will admire the different floors of the palace, discover the history of its construction, which lasted 12 years, and of Napoleon the Third, who is not as famous as Napoleon the First but every bit as important in France’s history. You can finish in the big gardens of the palace, under the shadows of blossoming trees. Our advice: Go during Spring to enjoy the gardens. There are in fact two “Cathédrales de la Major”. The old Major, in a roman style, was built in the 12th century and was destroyed almost completely in the 19th century (only the choir and one alley are left). 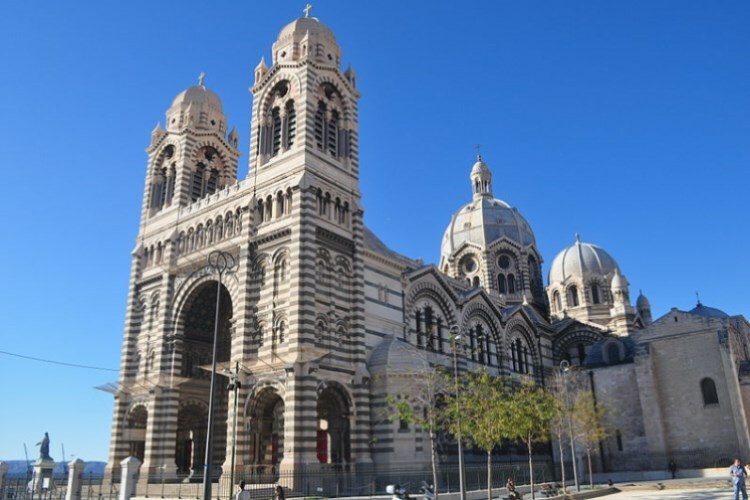 The new cathedral, or Sainte-Marie-Majeure Basilica of Marseille, was built upon the old one between 1852 and 1893. Its unique architecture with marble and porphyry is inspired from the byzantine architecture, hence the characteristic domes. The cathedral location is intriguing as well, between the port and Marseille’s streets, it is almost stuck between “two worlds”. That may be its strength and specificity: to reconcile two worlds, past and present. Our advice: Visit it on the 15th of August, to attend the famous “procession de la Madone” (the Madone’s procession). This is a unique place in Marseille: they propose to you to blurr your sense, in order to discover them better afterwards. The Sensa Marseille is a sensory experience inviting you to leave your comfort zone and test your five senses through different activities. The most famous of theses activities must be one of those dedicated to the sight. You will be in absolute darkness, a very amusing and confusing experience. The goal is to win against another team, in a light atmosphere. It is better to go with some friends or with your family. The SENSAS also proposes blind tastings, with 9 dishes, 45 ingredients and 6 coooking trials. The SENSAS truly is a wonderful experience, try it ! Marseille’s gastronomy is most famous for its bouillabaisse. It is a special fish soup of the city. Although many restaurants have bouillabaisse on the menu, most of them are expensive or with a very low quality. Fortunately, it is possible to enjoy an authentic bouillabaisse with fresh products. The restaurant we are about to tell you about is one of those places whose location you keep as a secret, since the quality is so good. 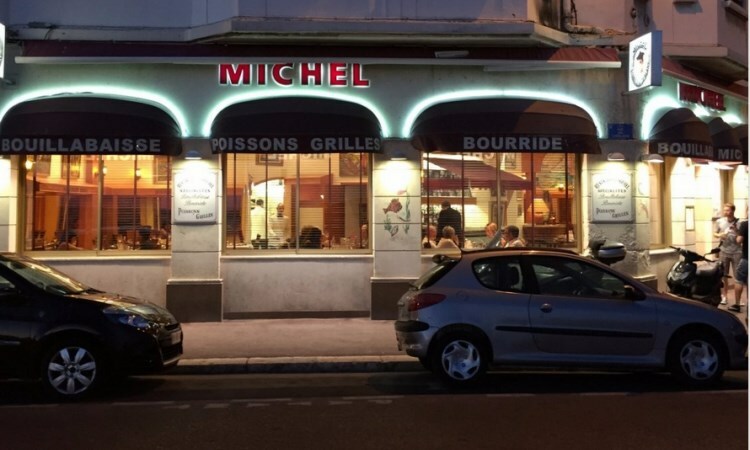 The restaurant is called Chez Michel, and every product is fresh from the day’s catch. There, recipes are passed from generation to generation, and everything is handmade, which gives a real cachet to the establishment. Our advice: Try to have a restaurant using fresh products to have the best bouilabaisse. 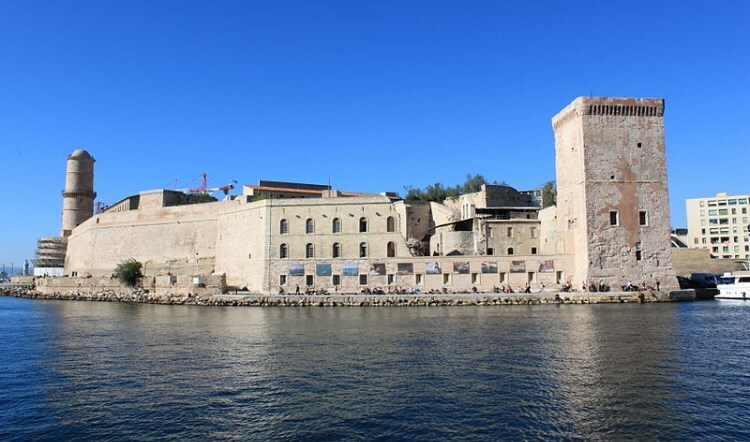 There is no place more representative of Marseille than the Vieux Port (the old harbor). According to the legend, this is where everything began. The Vieux Port is the true heart of Marseille, where everyone gathers. It is the oldest harbor of the city, and the rendez-vous point of both the inhabitants and the tourists. It is one of the most authentic places of the city, with shopping streets and the downtown nearby. 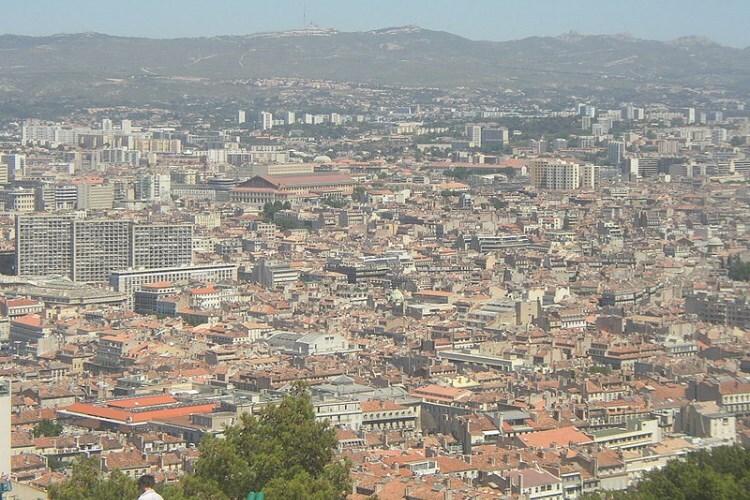 You will discover there the true atmosphere of Marseille, as seen from an outsider’s point of view. The Vieux Port is a social and cultural center of the city. The traditional fish market reminds us of how much the city depends on the sea. The numerous bars and restaurants make it the ideal place to rest for a while. Our advice: You may want to dedicate your whole day to the Vieux Port to enjoy it the best way possible. 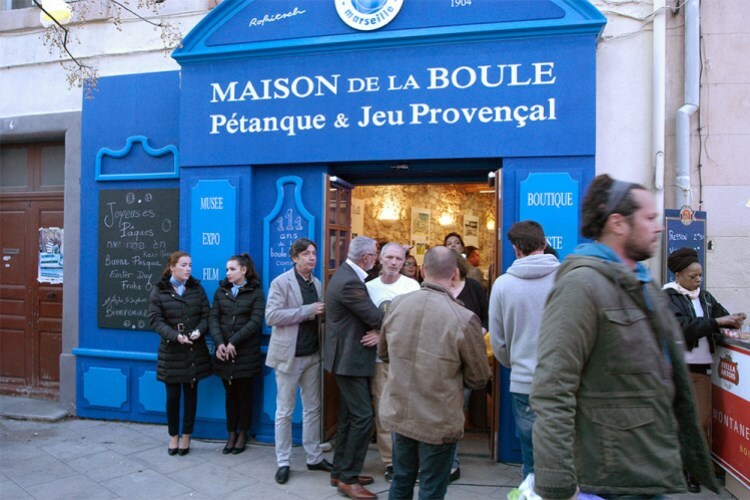 The Musée de la Boule opened in 2015 in this beautiful blue house on the Place des 13 Cantons. This small museum is growing up and explains the history of pétanque, or boules, this French sport very popular in Marseille. You will discover some retrospectives about the history of this sport, from stone boules from the antiquity to the steel modern boules. You can also go to a working group on the production of theses boules. Hervé Rofristch, owner of La Boule Bleue, the last boules’ factory in Marseille, created this place for boules amateurs. He wanted to open a museum to this sport whose emblematic city is Marseille. The visit ends in a boulodrome, a track to play boules and train. The owner really loves this sport, you can see it in its involvement and in every detail of the house. He likes to share his passion. This is a lovely place for boules amateurs but also for the beginners, the museum being a nice first contact with this sport. Our advice : come with your own set of boules to challenge the other visitors. This park aims to preserve both nature’s and human’s activities. It is quite big, with activities both on the ground and at sea, so you can have long strolls and enjoy the unique and wonderful view of the Calanques. Whether you love hiking or prefer short walks with your family, this is and ideal place, with more than 20km of indicated paths. 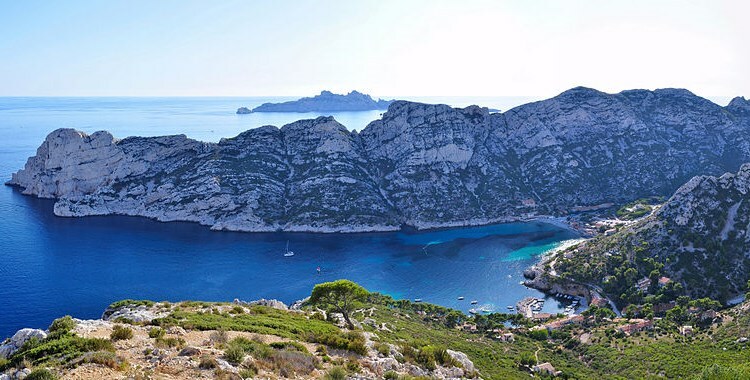 The Calanques are a place to see at least once in your life. Among the numerous activities of the Calanques, you can jump like Tarzan with a rope over the sea, after a 45 minutes walk and some climbing. Who will be brave enough to try it? Our advice: Take solid and comfortable shoes, you will need them. Notre-Dame de la Garde, also called “La Bonne Mère” (the good mother”) is an iconic figure of the city. According to the legend, she watches over sailors, fishers, and all Marseille’s inhabitants. The basilica offers you a magnificent view over the whole city, from the Vieux port to the Frioul archipelago. The Basilica had first been a small 19th century chapel, but it soon became too small to welcome the pilgrims. Cardinal Mazenod decided to replace it with a big basilica. It took a romano-byzantine style with domes, mosaics and stones of several colors. During your visit, you can see a low church with a crypt and a crucifix from the 16th century reminding us of the modest origins of the basilica. If you follow the tour, you will access the high church and the sanctuary dedicated to Mary where golden mosaics are shine under the light. 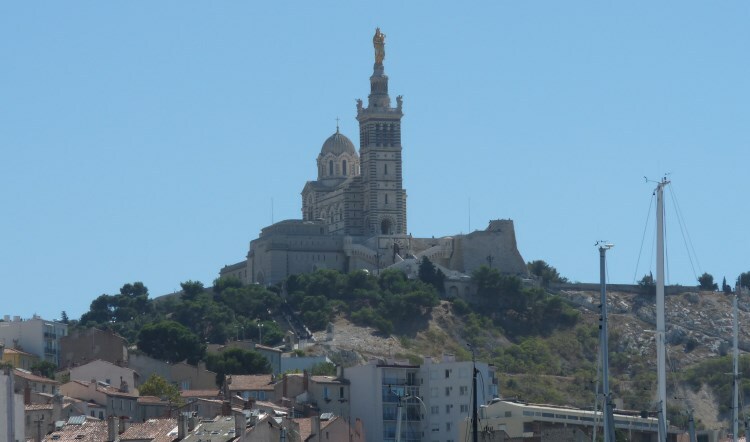 Notre-Dame de la Garde witnessed the history of Marseille, and its golden brass statue, designed by Lequesne, has been watching over the city for many years. It is a pearl in a wonderful shell. Our advice: It is a very touristic place, try not to go on a week-end.